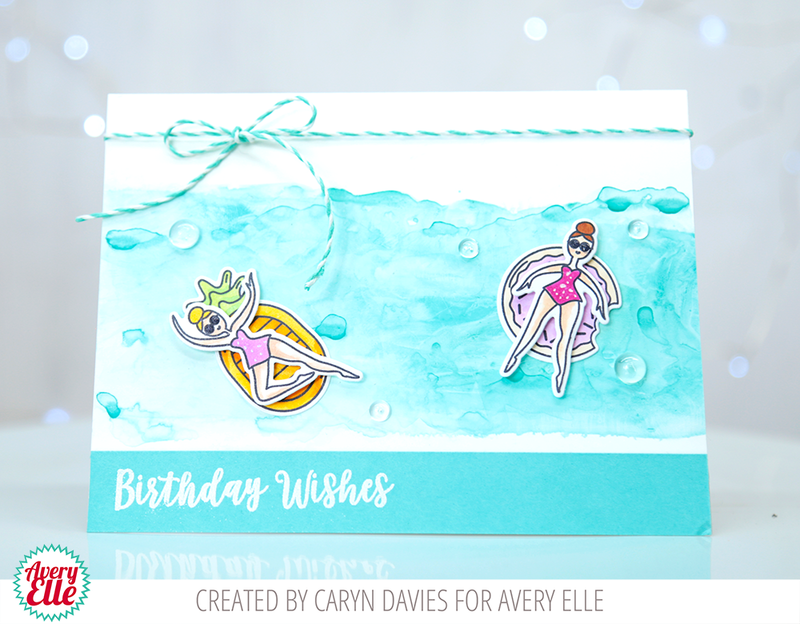 Hey there, it's Caryn here starting off a week of inspiration featuring the Splash clear stamp set and co-ordinating Elle-ments. Lately I've been having a LOT of fun with the new Avery Elle Liquid Watercolours (look out for a video coming very soon) and have created a perfect backdrop for my chilled out bathing beauties! I used a thin Yupo paper (picked it up on Amazon) and spritzed it with a fine spray of water before adding Aquamarine liquid watercolour onto it with a paintbrush. I wasn't too careful or precise as I wanted the background to have some movement and appear more ... watery! The paper was put aside to dry naturally which does take a bit of time so it's a good idea to create a few background panels in advance so you have them on hand and ready when you want to put a card together! I stamped a couple of ladies and their floaties of choice onto Neenah white cardstock and coloured them with Copics and then die cut them. I glued the dried watercoloured panel onto a white A2 card front (landscape orientation) and then added the ladies and a few clear droplets here and there. I finished of by cutting a strip of aquamarine coloured card and white heat embossed the Birthday Wishes sentiment from the Critter Crew set and tied it off with some Aquamarine twine.